Many developments have been carried out in carburizing technology and many articles on this process have been written. However, we feel it is important to remind new engineers of the basic rules that justify the strong development of this process. Carburizing is simply defined as adding carbon to iron or steel, by heating in the presence of carbon to harden the surface of a component. Depending on the metallurgical recipe, the hardness can vary with carbon content. This process can be achieved in either a Conventional Furnace (Atmosphere Furnace) or a Low Pressure Carburizing Furnace (LPC). • Conventional Furnace (Atmosphere Furnace): conventional carburizing is an atmosphere controlled process with control of the carbon potential. • Low Pressure Carburizing Furnace (LPC): low pressure carburizing is running without any oxygen and with injections of carburizing gas (acetylene for example). Conventional carburizing is a popular method using older but reliable technology. This proven technology has been instrumental in pioneering the carburizing process for a number of industries. Economical and cost effective, this furnace remains stable due to its process which provides constant carburizing case depth due to the precise control of the endothermic gas. This mixture of hydrocarbon gases and air provides the carbon potential (CO) necessary for the carburizing process. Due to the presence of oxygen in the atmosphere, there are risks of intergranular oxidation (IGO), decarburization and scaling on the surfaces of the treated parts. The constant control of the carbon potential and the ratio of hydrocarbon gas, hydrogen and nitrogen safeguard the surfaces from deterioration. • Permanent injection of endothermic gas mixture at atmospheric pressure in batch or conventional furnaces. • Even level of carbon content in the furnace. • Length of furnace (conventional furnace) or duration of cycle (batch furnace) is relative to the case depth requirement. 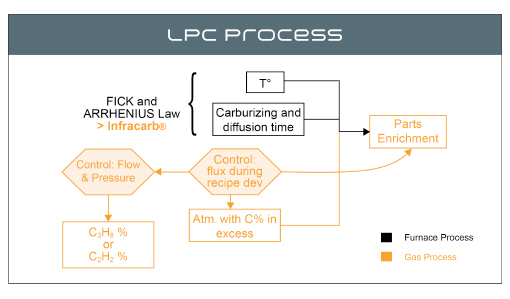 The LPC process has been chosen for its tight process control, its repeatability, optimized metallurgy and shorter cycle time at higher temperature versus atmospheric carburizing. The development of a new technology of carburizing for new applications requires an understanding of the standard processes. 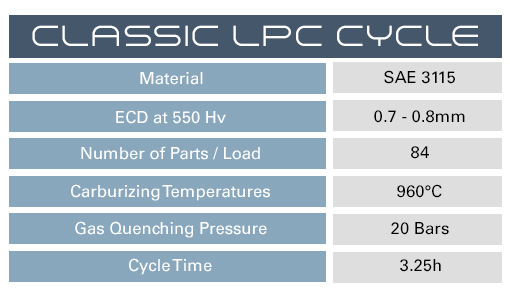 The LPC process is a thermal treatment using alternative boosts of carburizing gas and neutral gases without causing inter-granular oxidation. This process also provides uniform homogeneity of carburizing case depths thanks to a precise control during the recipe development. The target is to develop carburizing recipes at higher temperatures and with a higher enrichment capability without affecting the material properties. • Hydrocarbon thermal cracking at low pressures (7-13 mbar) in a vacuum cold wall furnace. Alternate injection of hydrocarbon gas boosts (carburizing) and of neutral gas (diffusion). • Number and duration of the steps are determined by the case depth required. While older technology is more familiar, there are many benefits to new advanced LPC technology. The newer technology of vacuum carburizing is based on the enrichment of carbon on the surface by the cracking of a single carburizing gas (typically propane or acetylene) at a low pressure. Thus, the vacuum has the advantage to improve the absorption of carbon. This absorption of carbon is simulated during the validation of the process and is tracked each time the recipe is run. 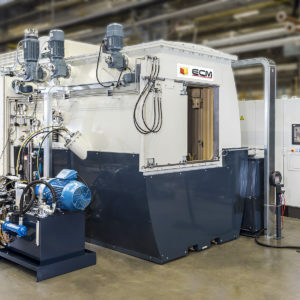 ECM Group offers both carburizing gas options for any specific needs in the heat treatment industry. ECM Technologies’ ICBP® LPC furnaces use the Infracarb® patented process. Infracarb® consists of alternately injecting hydrocarbon (C2H2 or C3H8) – which enriches the surface by breaking the molecule at high temperatures – and a neutral N2 gas for diffusion. 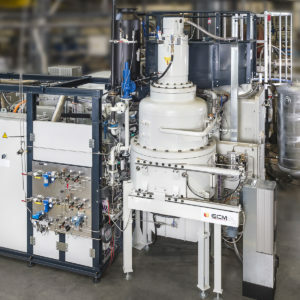 The objective is to maintain a high level concentration of monoatomic carbon – obtained after the dissociation of the reactive gas on the surface of the parts – without reaching the carbon solubility limit in the steel, and therefore, no soot accumulation. 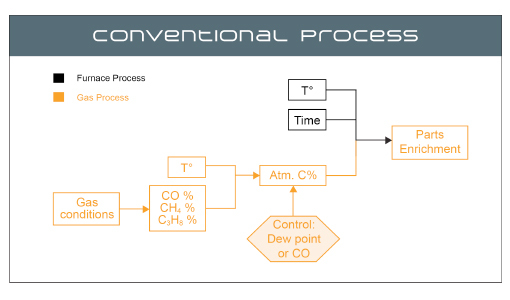 Thus, the reaction yield is greatly superior to that obtained in traditional conventional atmospheric carburizing based on a CO/CO2 balance, while still being less prone to atmospheric changes. The absence of carbon potential notion in low pressure carburizing eliminates the need for in situ control and makes the process easier. 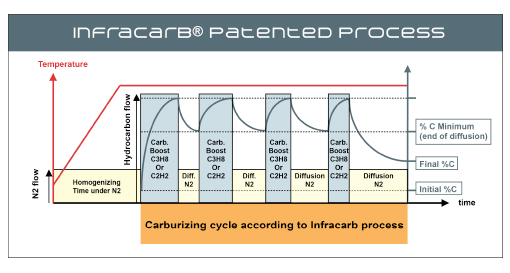 This Infracarb® process ensures precise control of simple physical parameters for optimal results: temperature, length of the gas injection phases, flows and pressures. The process temperature is generally higher than traditional carburizing, between 880 and 1,050°C. The cycle time is reduced significantly: up to 50%, depending on the carburizing depth. C2H2 Acetylene – used for low pressure carburizing – and N2 nitrogen – used for diffusion – are the most common gases used in the Infracarb® process, under standard conditions. Acetylene is a synthesis gas, and its purity can be controlled providing exceptional chemical reactivity (dissociation rate is over 60%), which allows very complex parts such as diesel injection components to be carburized. Also, it is not very sensitive to possible heterogeneity in washing before treatment and prevents the occurrence of soft areas. Large surface areas can be carburized and it has a high enrichment effect. The number and length of the phases depend on the carburizing depth required. Simulations using Infracarb® allow precise adjustments of recipe parameters to achieve perfect control of the carburizing depth. The LPC furnace uses a cold wall technology so the exterior surface of the furnace stays at a low temperature, reducing the amount of heat emitted into the plant. Without any flames, or hot walls, the furnace can be located in the middle of the machining area within the plant. This allows for a better part flow in the plant, and eliminates the need for a fire proof wall enclosing the heat treat area. 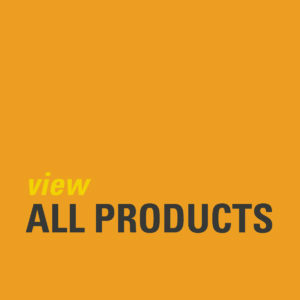 (See Fig 2 and Fig 4) With the cold wall technology, dangers specific to hot wall technology are also eliminated such as open flames and hot surfaces. In addition, the plant does not need ventilation hoods to get rid of the burnt gas. 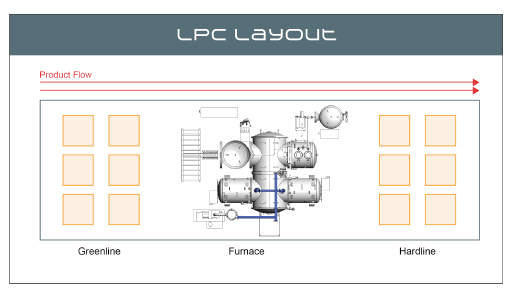 For these reasons, the LPC furnace occupies less floor space in the plant, especially as it allows a higher throughout. Safety concerns regarding the use of acetylene are also easier to address. The acetylene suppliers now have supply solutions with reliable explosion proof systems and fire prevention systems. Since the endothermic gas is not needed, there are no concerns regarding carbon monoxide. The biggest advantage of an LPC furnace is the reduction of the cycle time using higher carburizing temperatures. 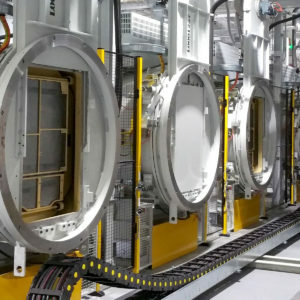 Some production parts are now carburized at 1030º C (1886F), reducing the carburizing time approximately 75%, and new trials are going to even higher temperatures. The modularity of the equipment also provides advantages. All chambers are independent allowing a different cycle at different temperature to run in each. It is easy to add additional chambers on an LCP furnace to increase the overall production volume whereas a conventional furnace is limited to its original number of chambers. 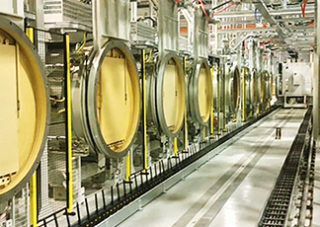 Moreover, in times of decreased production, it is easy to turn treatment chambers off, while the conventional furnace has to run at full capacity with empty trays. Efficiency and energy savings are further advantages of the LPC furnace. The vacuum technology is the most efficient with only 35 KW to maintain 2200 LBS of steel at temperature. The gas usage is reduced tremendously as it is used in the most efficient way. 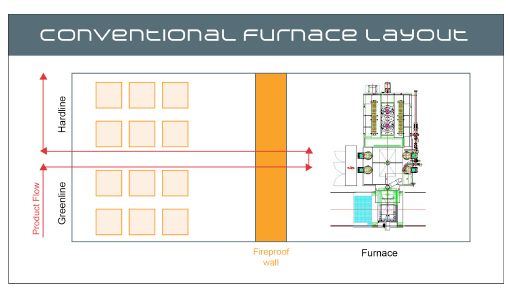 LPC furnaces can be ready for production in as little as 90 minutes and each chamber can be turned on or off at any time to be ready for production in 30 minutes. Finally, the LPC furnace is so similar to a machining center that both can be operated and maintained by the same team. The entire process control is done by the equipment, without the need for controlling the carbon potential or the dew point. The system control time, temperature and flows are the only process variables. Maintenance of an LPC furnace is easier with less danger and less permitted confined space requirements. With only electric heat, the system does not need a burner specialist, and standard maintenance tools can address equipment issues. In conclusion, there are significant differences between a conventional furnace and an LPC furnace. 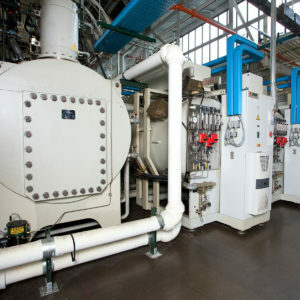 Low pressure carburizing carried out in vacuum furnaces with cold walls offers many advantages compared to traditional conventional atmospheric carburizing: no oxidation, better carburizing homogeneity, excellent reproducibility of the load to load processing, tightening of the metallurgical tolerances such as the carburizing depth, and finally, core hardness. The LPC process respects environmental standards as it significantly reduces CO2 emissions and harmful chemical products. 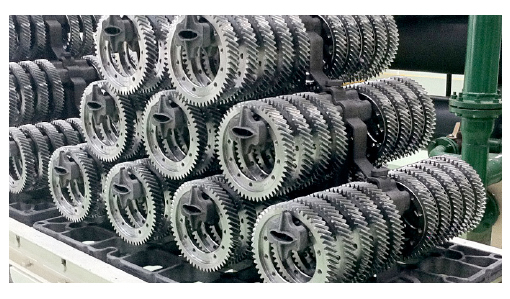 In an ever-changing industry, becoming familiar with the newest technology will push your production to perform at its very best and meet your demands for increased productivity and higher quality parts.